This is my first year gardening (well, first semi-successful year, lol) and I think I've planted a few things a bit thick. 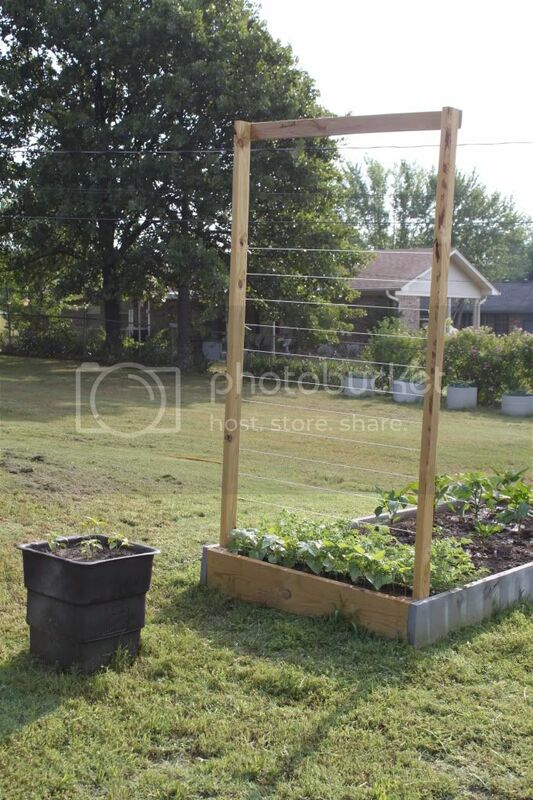 1) We built a 3'x7.5' a-frame trellis and covered it with 2"x4" wire fencing. I currently have 7 Burpless cucumbers growing up one side and 5 National Pickling cucumbers growing up the other side. Should I thin a few of the Burpless or just let them go? 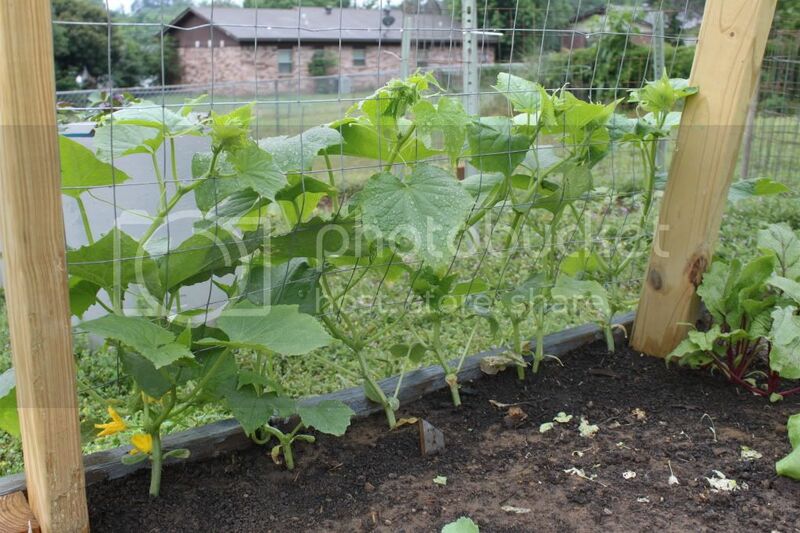 2) I have my Kentucky Wonder pole beans on a 45"x7.5' trellis and I have 12 bean plants right now...too many? 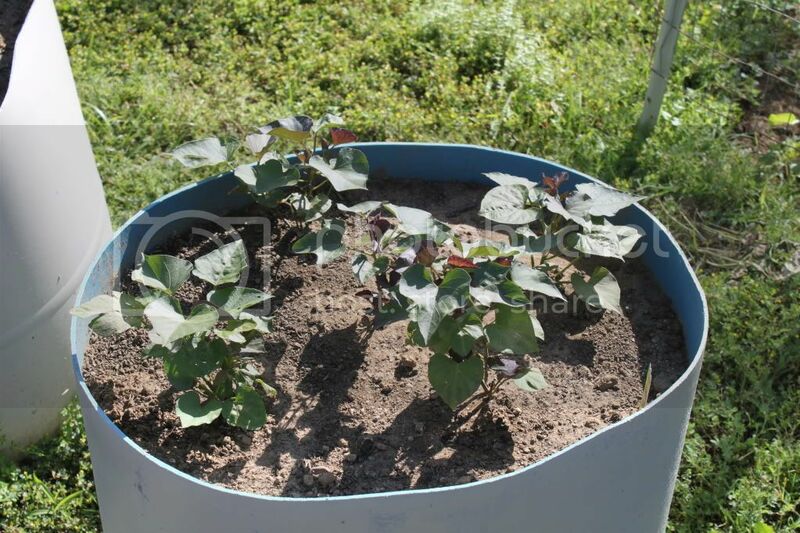 3) And, lastly, I planted Beauregard sweet potatoes in a 55 gallon plastic drum that we cut in half. I planted 5 in one and 4 in the other but now they're looking a bit crowded. Very nice garden! What are you going to plant under the A-frames? As for thining I have no clue but it looks ok to me. but this os my "first" year. The cukes and beans I would let them grow as is. See how this works? Already you have two opinions and you will do as you think necessary in the end. You will get a better idea after you have grown some things. The sweet potatoes, I would lean towards thinning. Heck, I don't know enough to tell you how many plants you can have in a given space. I just want to tell you that the stuff you built is really cool! Going on instinct, I think those sweet potatoes are too crowded. 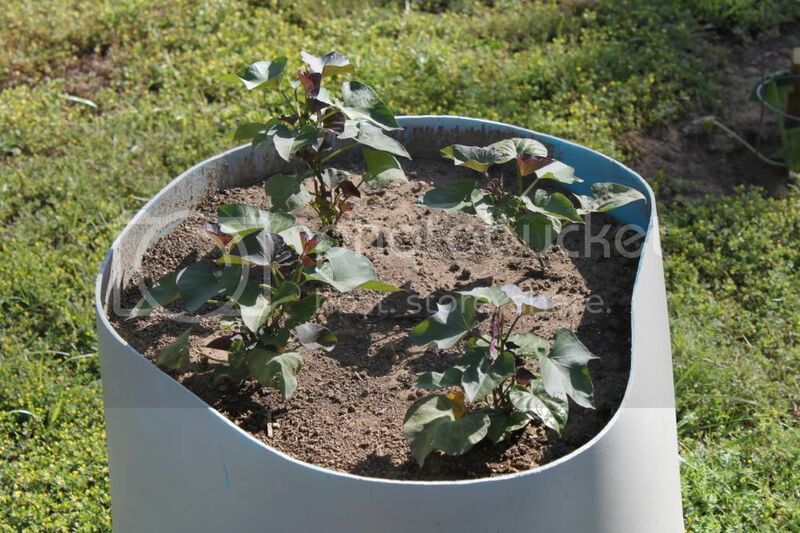 The other stuff should do fine with plenty of water and nutrients. That's my very humble opinion. your cukes will be fine. 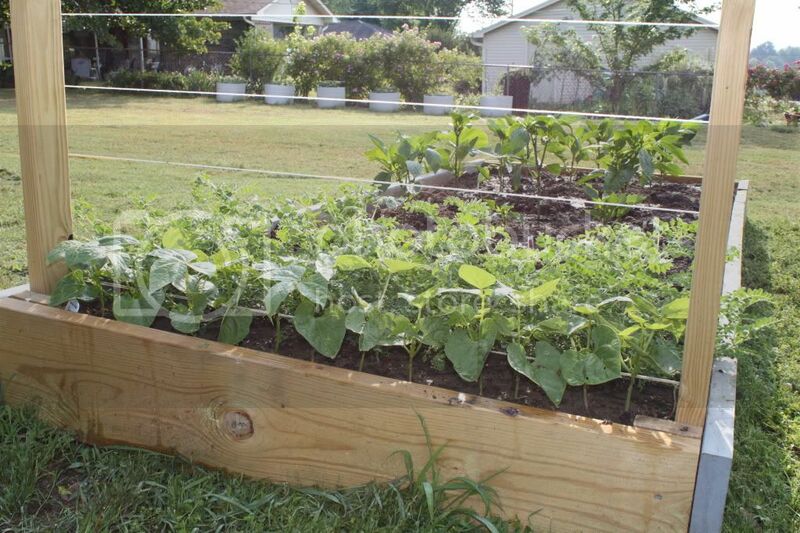 trellised cukes do well spaced 9 to 12 " apart. I'd thin the sweet taters they are crowded. Thanks for all the kind words and advice! I thinned the cukes down to 3 of the Burpless and 4 of the Pickling. 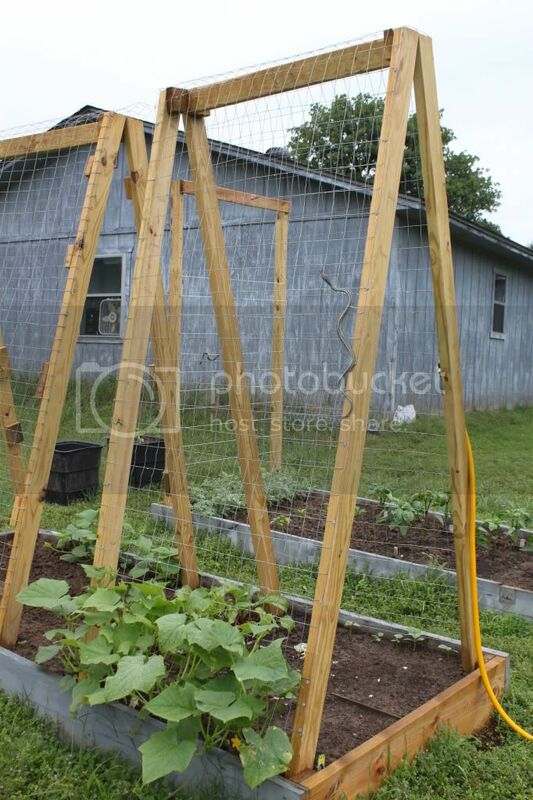 You're right, Marlingardener, that will be plenty for us and suits the trellis much better. I plucked all but 4 of the beans...I knew from the start that 12 would be waaay too many but I had trouble getting them to germinate the planting prior to this one so I over compensated a bit too much, lol. Now, as for the sweet potatoes...I don't have more barrels (I used them all for my Roma, Homestead, Tommy Toe, Black Plum, and Coyote tomatoes that are along the fence in the bean pics above) and our ground is so rocky that I'm afraid they wouldn't do well at all out of a container. I originally intended to try some red skin potatoes under the a-frames but I read on several companion planting sites that squash/cucumbers and potatoes don't get along. Anyone know if that's true? How about the sweet potatoes? My neighbor had the same result from his this year...guess it just wasn't a good Spring for radishes around here. I also planted spinach, carrots, and bibb lettuce but none came up. I think the birds had a lot to do with many of my early fails, hence the plastic snakes. They seemed to have helped keep the birds away and for $1 is was worth a try. Hah! I didn't even see it the first few times I looked.